While IT executives struggle to tackle evermore challenging business requirements in the face of one disruptive technology after another, they are often hemmed in by capped and inflexible budgets that include high fixed and sunk costs. Yet when IT leaders are asked to report on cost and performance of their products and services, they find themselves with little insight into the real business value of their investments. To better align IT services with business priorities, leaders need to be able to show definitive and traceable correlations between IT spend and the business. Technology Business Management (TBM) is a best-practices discipline that helps IT achieve full cost control and transparency and provides leaders the insight and information they need to enable growth. Here are the Top 5 initial steps to appreciating TBM. 1. Understand TBM. TBM software solutions in the market, like those offered by leading-edge provider Apptio, automate processes which help leaders understand, compare and analyze costs in infrastructure, applications and services throughout the IT supply chain. 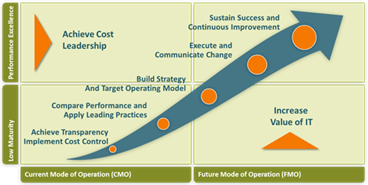 The resulting visibility informs decision making at all levels. Do you have an end-to-end connection between cost pools, towers, applications and services with a common taxonomy? Can you generate standard reports and analytics easily and swiftly? Is there ever a bigger topic with customers and your CXOs than the topic of cost? Do you know where to create distinct, client-bespoke solutions and how to fund more innovation? Can you measure your value and show it to the business? 3. Get to know what TBM can do. TBM is instrumental in building service catalogs, setting appropriate charge-backs and show-backs, rationalizing technology portfolios, defining and sourcing the IT supply chain, and understanding and managing demand. If business managers have visibility into the true cost of a service, they can better determine what they need, and the business will begin to see how investments drive improvements in cost and service. 4. Explore the appropriate level of TBM realization. It is important to understand what pieces of TBM are relevant, when and for whom. TBM is not a tool; it is the path to a performance-based culture for companies that seek continuous improvement. It requires full buy-in from throughout an organization, especially its executives. 5. Prepare yourself for the “aha! moment.” TBM-generated information fuels strategic planning. After all, the point is to translate the data into better and faster decision-making, to identify the gaps that keep you from best practices, and to take the right and prioritized actions toward a target operating model. ISG understands the challenges and opportunities in maximizing the value of IT. We offer TBM as part of our approach to transformational solutions. Contact us to discuss further.